Turn any TV into a Smart TV with the Samsung BD-J5100 Blu-ray Player. In addition to playing your favorite Blu-ray discs in high definition, this compact media box offers access to content via the built-in LAN. USB connectivity means you can access and share your photos, videos, and files directly through your entertainment center, while HDMI connectivity offers the highest quality audio and video. 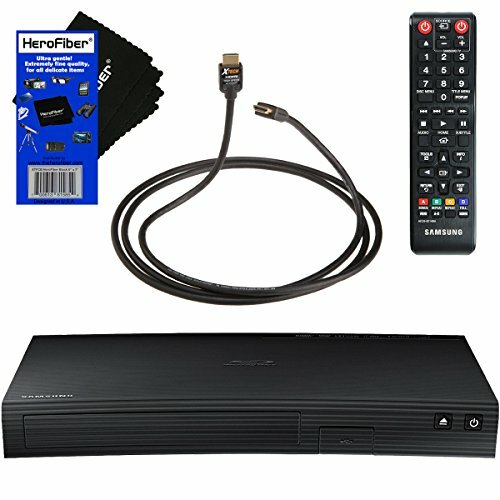 With DTS Surround and Dolby True HD delivering near-studio quality audio to your home entertainment system, the Samsung BD-J5100 is designed give you the most from your movies, music, and shows. start-up time of 0.5 seconds - compared to nearly 10 seconds for most Blu-ray players. Connect and share all your stored audio files from any USB storage drive or external hard drive directly to your Blu- rayTM player.